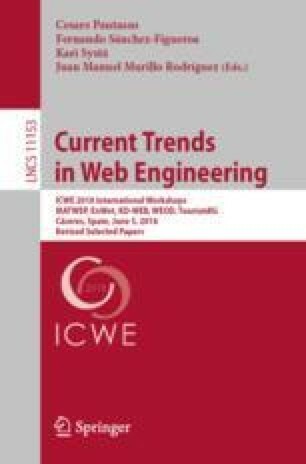 This position paper discusses the definition and implementation of Web-Physical (WP) user profiles, which allow the creation of personalized recommendations and innovative behavioral predictions in particular scenarios, i.e., fairs. The nature of a WP profile builds upon two different worlds: the Web (social networks and web applications) and the Physical one, each one of them being explored through (big) data collection platforms. These two platforms collect radically different information: on the one hand, information of appreciation towards a particular product or service (web domain) together with other metadata; on the other, the leases (x, y) of users in the exhibition space (physical domain). In this scenario, our research idea consists in identifying how the information in the two domains can be merged in a whole entity under a theoretical point of view: this will unleash tangible repercussions in terms of personalized recommendations and effective behavioral predictions, where with personalized recommendation we mean a suggestion to a user in physical terms (eg a pavilion to visit) and / or in web terms (eg a site to visit) and with behavioral prediction a prediction of where a user can go in the future, even in a multimedia perspective (physical + web).